Writers On The Move: Up to my Eyeballs with Eyeball. Fall is here and Halloween is on its way. 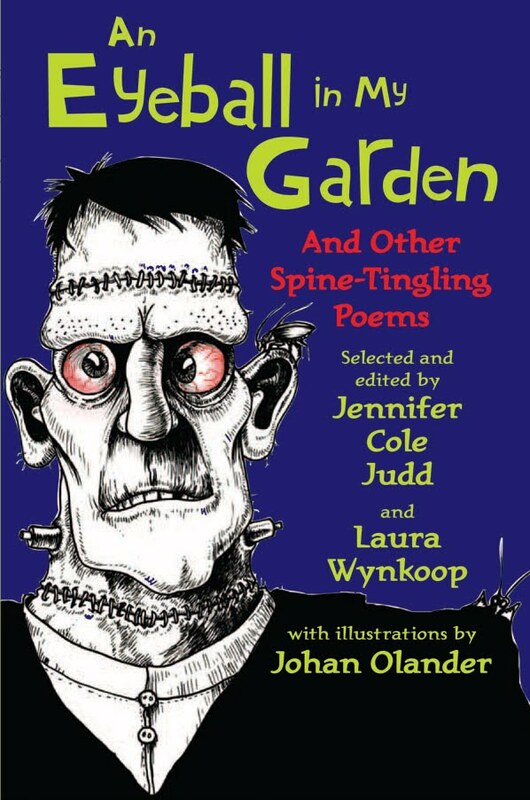 So now is a perfect time for me to talk about a poetry collection I’m involved with titled, An Eyeball in My Garden: And Other Spine-Tingling Poems . I have been very busy promoting this collection recently, since it is a seasonal book. This poetry collection was put together by me and thirteen other terrifyingly talented poets. It contains everything from the humorous, to the creepy, to the absolutely sinister, this collection is designed to tickle your funny bone and then perhaps, gnaw right through it. So before the trick or treaters arrive, you may want to introduce yourself to some ghoulish delights like the monster in Winking Wot Warning, or to try a dish off the Mummy’s Menu, or to really find out Where Nightmares Dwell, if you dare. You’ll be glad you did. Please visit An Eyeball In My Garden website for Halloween craft ideas, fun and spooky interviews, and cats wrapped in tin foil. Horn Book (Spring 2011): "This compilation of new poems covers scary as well as silly Halloween territory. For every truly chilling ghost train, there's a witch's shopping list or a monster that turns out to be the speaker's own reflection. Easily flowing meter in most of the pieces makes for smooth read-alouds. Black-and-white ink illustrations are appropriately spooky." Publishers Weekly August 9, 2010- Gr 4-7— Readers should be prepared to shiver and shake through these 44 poems about ghosts, gargoyles, and more. Olander adorns each page with ominous ink images of spiders, monsters, and other terrors, while the verses temper horror (Craig W. Steele’s “Where Nightmares Dwell”: “I know too well/ What creatures lurk/ Where nightmares live and grow.../ The shadows found me years ago!”) with humor (Stella Michel’s “Mummy’s Menu” includes “Blackened pudding filled with flies,/ Crispy scarab beetle pies”). Whether it’s Halloween or not, this creepy collection will please readers with a taste for the supernatural. This book is available from Marshall Cavendish, Amazon.com, Barnes & Noble, or ask your local book store. Be sure to check out my poems, Our Neighborhood and The Gargoyle. Kevin McNamee is a writer and poet living in Yonkers, N.Y. He is the author of several children’s books and is a contributing author to this poetry collection. To find out more about Kevin, please visit his website at http://www.kevinmcnamee.com/ or his blog at http://www.kevinmcnameechildrensauthor.blogspot.com/. Holy cats. What a great Halloween title. What a great title, period. What a great title to market! Kevin, the collection sounds like great fun. Good luck with it. Hi Stephen, just found your new blog. I will follow you even though you have eyeballs in your garden. Where is CSI when you need them? I agree, great title. Sounds like a fun collection. 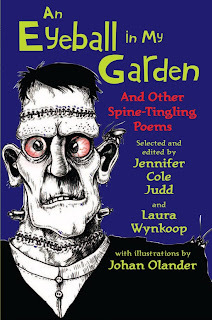 Themed poetry is a fantastic way to promote and move collections, and this one sounds so fun and just right for October. I love the idea of seasonal poetry to get children involved -- more schools need to use poetry in their lessons. I also agree, a target on title. It does sound like a fun collection. Love the title ... the visual in my head, not so much! Thank you all! Sorry I'm late to the party. I've been dealing with various computer problems. It is a great title, and poetry is top notch. I think there is something for everyone here. Fun post. I found myself remembering a game my sons used to play with bouncy, very icky and halloweenish eyeballs.